Geneva – IOM, the UN Migration Agency has launched its new Missing Migrants Project website: https://missingmigrants.iom.int/. The Missing Migrants Project tracks migrants, including refugees and asylum-seekers, who have died or gone missing while migrating to an international destination. New informative graphs, maps, and charts are featured to make understanding Missing Migrants Project data even easier. Users can view individual data points by zooming in on the maps at the top of each page, and can filter the charts by month, year and region by clicking on each graphic. In addition to the page highlighting migrant fatalities data in the Mediterranean, the new website features graphics on different regions and hotspots across the world, including the Mediterranean and Middle East. Users can explore trends in Missing Migrants Project data on Europe, Africa, Asia, and the Americas by selecting an option from the drop-down menu titled ‘Regions,’ or by selecting a region at the bottom of the home page. Missing Migrants Project’s full dataset is now available for download as either an Excel or .CSV file. The dataset contains information on each incident in which a migrant death was recorded, and includes data on the circumstances of the death as well as the profile of the migrants involved, where available. Not interested in data and graphs? 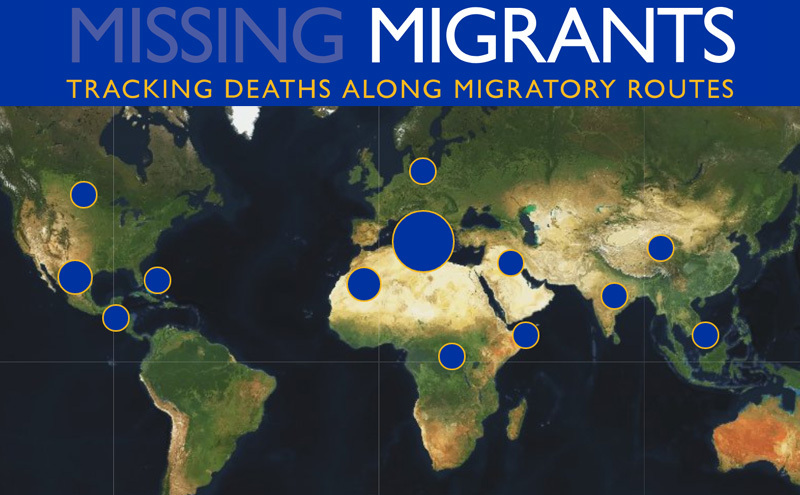 In-depth analysis of Missing Migrants Project data and other topics relating to migrant fatalities can be found on the new publications page. For more information, please contact Julia Black, Tel: +49 30 278 778 27, Email: missingmigrants@iom.int.